After a devastating accident, University of North Dakota forward Lisa Marvin is battling long odds to play hockey again. Lisa Marvin's life nearly ended on a frigid November afternoon in 2014. The sophomore forward was on her way home after practice with the University of North Dakota women's hockey team, traveling west on one of Grand Forks' more heavily used stretches of road, when her black 1980s-vintage Dodge truck started to stall. "It must be the gas," Lisa thought, knowing the unreliable gauge likely indicated more fuel than she actually had. So she pulled over and stopped across from a gas station. Dashing across the median of Gateway Drive, she bought a portable gas container and filled it up. Back at her truck, Lisa looked for oncoming traffic. A pack of cars had stopped at a red light about 200 yards away. The gas cap was on the driver's side, so she had to stand next to the road while she filled the tank. Snow started to lightly fall as she emptied the container as fast as she could. “The next thing I know, I'm in the hospital room waking up not knowing where I was," she says. A speeding red Chevrolet Cavalier had rammed the back of Lisa's truck. She was later told that the Cavalier and another vehicle were racing, and a witness said she'd looked up to see Lisa fly through the air and land on the pavement. The 18-year-old driver of the Cavalier was later sentenced to 126 days in jail on an aggravated reckless driving charge. Lisa was sentenced to more than a year, and counting, of grueling recuperation and uncertainty, but she has refused to surrender her dream of again playing the sport she loves. The second of David and Kallie Marvin's three children, Lisa grew up in Warroad, Minn., a tiny lake town only minutes south of the Canadian border that is known for its year-round fishing and hockey. At age two, she followed her three-year-old sister, Layla, onto the ice when Layla started playing hockey. Lisa was hooked immediately. "It was all I knew," she says about her childhood. "It's just what you do in Warroad." 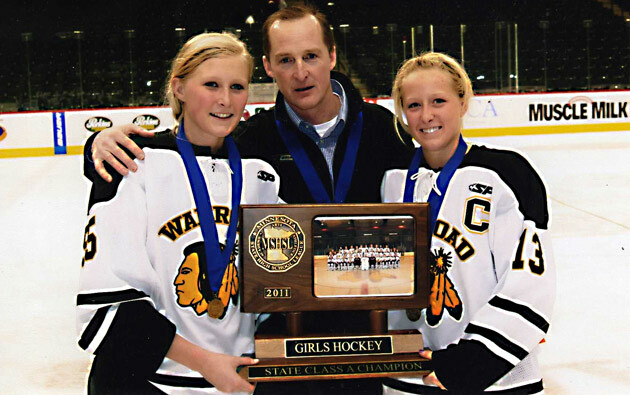 In eighth grade, Lisa joined Warroad High School's varsity girls hockey team. By the time the lean 5' 8" forward graduated, she was a five-time letter-winner, a two-time All-State selection by the Minnesota Girls Hockey Coaches Association, and an offensive threat who tallied 94 points in her final season with the Warriors. Her team made four straight state tournament appearances and won section championships each year from 2010 through '13 plus state titles in 2010 and '11, finishing second in 2013. Lisa earned Minnesota State All-Tournament Team honors all three of those years and set the tournament record for career points (34). In 2013, Lisa followed in her family's footsteps and headed to Grand Forks to play for North Dakota. Her grandfather, Calvin Coolidge Marvin, had co-founded the university's hockey program. 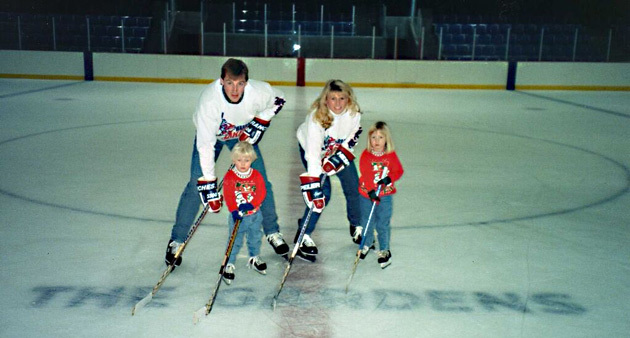 Her father played for North Dakota after being drafted out of high school by the St. Louis Blues in 1987. (David never made it to the NHL, but he later became the head coach of Warroad High's girls team.) Layla also wore North Dakota's sweater. During her freshman season, Lisa scored six points in 36 games while adjusting to the college game. When her sophomore campaign started off poorly, she was a frequent healthy scratch before she finally scored her first goal of the season, against Bemidji State. Three days later everything changed with her accident on Gateway Drive. Back in Warroad, Lisa's parents were sitting at the bar of Izzy's, the lounge and grill they own and run along with the adjacent Patch Motel, when the phone rang. It was Layla. David's eyes grew larger as he listened. Kallie heard her husband tell their oldest daughter to calm down. He then explained to his wife that Layla thought Lisa had been in an accident, but didn't know where Lisa was. Kallie went to her office and dialed Altru Hospital in Grand Forks. A doctor confirmed that Lisa was in the emergency room. Her vital signs were good, he said, but he urged Kallie to get there as soon as possible. Meanwhile, Layla was sprinting through Altru's parking lot when her phone went off. Caller ID said it was Lisa, but it turned out to be a nurse from the emergency room who was calling to tell Layla that Lisa had been hit by a car. When Layla reached the room, Lisa was lying covered by a pile of blankets. She had been drenched in gasoline, the smell of fuel immediately noticeable. Her platinum blonde hair was streaked with blood, her face scraped. But it wasn't the cosmetic injuries that doctors had to worry about. Lisa's right arm had been crushed and broken in three spots. The humerus bone was missing a three-inch chunk. It had splintered and punctured the skin, creating a hole the size of a large bottle cap. Her right knee had been destroyed, its anterior cruciate, medial collateral and posterior cruciate ligaments torn, the oblique lateral and meniscus also damaged. Medical staff were getting Lisa ready for emergency surgery when Kallie, David and Lisa's younger brother, Max, arrived at the hospital. While Lisa was in the operating room, her family and two housemates from North Dakota's hockey team camped out in the lobby. By 10 p.m., the lights had dimmed and the group's only company was an elderly lady working an information desk and a TV airing a local newscast that included a story about Lisa's accident. ​She would have a second surgery on her arm three days later before being being released from the hospital with her future in doubt. A week at home and Thanksgiving followed before a chartered flight took Lisa and her mother to the Steadman Clinic at Vail Valley Medical Center Vail, Colo., where Dr. Robert LaPrade, one of the country's top orthopedic surgeons, spent more than two hours rebuilding Lisa's knee. On the morning of Dec. 3, she made her way downstairs to the first floor in a pair of blue paper shorts and began physical therapy. Lisa and Kallie stayed in Colorado for roughly two weeks while Lisa had two daily sessions in which therapists had to bend her knee. Occupational therapy was added for her arm. More knee work was done at Lisa's cousin's condo in Vail where she and Kallie stayed. The cousin, Brett Mueller, a physical therapist doing a residency at Steadman, had urged Kallie to bring Lisa there. "I was never so glad as to not be left alone with Lisa because I was scared," Kallie says, explaining that Mueller was a source of reassurance as well as valuable resource, and that she constantly called Lisa's doctors and nurses to consult them. "Never, in my whole life have I seen a person in such pain as after that surgery." An anesthetic nerve block was used to numb Lisa's right leg, but only by about 80%, for three days. A second was needed after the first wore off. Vail Valley gave Kallie a list of drugs and instructions, and put her in charge of Lisa's around-the-clock pain management while the two remained in Colorado. Kallie kept a medication log, set alarms on her phone to make sure she never missed a scheduled dose and always knew when she was supposed to feed her daughter or put fresh ice in the small therapy machine Lisa wore on her knee while lying on the couch. "For about four days, I honestly couldn't tell you if it was day or night," Kallie says. "The longest stretches of sleep that I got were, like, two-and-a-half hours." Once Lisa returned home to Warroad, life was an adjustment for everyone. Accessibility was taken care of at the family's two-level home by adding a wheelchair ramp on the stairs leading from the garage into the house. A detachable shower head and waterproof chair in the bathtub were installed. Grab bars and a lift on the toilet seats were added, too. "My parents sacrificed a lot," Lisa says. Kallie quit working at the family business for three months in order to take care of Lisa, who was confined to a wheelchair. During that time, Kallie did pretty much everything for her daughter. She spoon-fed, bathed and dressed her, and fetched her things like books or a laptop. Being stuck at home wore on Lisa. Though she constantly kept in touch with her hockey teammates at North Dakota and saw them whenever possible, it wasn't enough to shake how much she missed them. Boredom was also an issue. One day blurred into the next. Few friends from high school were around, and Lisa was limited in what she could do since the right side of her body still wouldn’t cooperate. If she wasn't at physical therapy or at Max's hockey game, chances are you would find her hanging out at home doing schoolwork or watching television. "I watched a lot of Netflix," Lisa says, noting that the show White Collar was a staple. "I think I did a whole season in one day." "You could tell she wasn't exactly loving life being in a wheelchair," Layla says. "But she made it look a lot easier than I think a lot of other people could have." By the end of the third month after the accident, Lisa was on her way to becoming independent again. She had perfected using her left arm to wheel herself to the kitchen sink and she used the counter to pull herself up to a standing position on her left leg so she could brush her teeth. Around the same time, she started transitioning from her wheelchair to a walker before trading the walker for a cane. Her right arm slowly started to come back to life after months of therapy and eight different braces. Shoulder mobility was the first part to return to normal. Range of motion in her elbow was next. Nerve growth, though, was another issue. A nerve surgeon told the Marvins that growth would come at a rate of about half an inch per month. It could be a year before Lisa's motionless, withered right hand woke up. The key word was, could. There was also the chance that she might not regain nerve function at all. After five months, Kallie hadn't noticed any progress in Lisa's ability to use the hand. Around her daughter, she stayed optimistic, but sometimes at night Kallie would lay in bed and question whether Lisa's hand would ever be normal. It turned out that Lisa just needed a couple more weeks. "By the grace of God, I tell you, at five-and-a-half months, she got up one day and said, 'Mom, look at this,' and she moved her pinky," Kallie recalls. "And then from five-and-a-half months on to the next 12 months, she did nothing but improve and get strength." After getting the go-ahead from her doctors, Lisa picked July 5, 2015, as the day she would return to the ice. It had been seven-plus months since the accident, and she knew that the day after the Fourth of July was the first time the local rink would be open for the summer. It had been 230 days since Lisa's life was so terribly changed. Recovery was far from finished. A return to hockey remained unclear. But on this summer afternoon, the only thing that mattered was her first slow lap on the ice. Lisa was eager during the morning leading up to the skate, but she grew nervous. She didn't know how her knee would hold up. Would it hurt? Would it swell? Would skating for even a handful of minutes set her back? There was only one way to find out. Wearing pads and an old North Dakota jersey, she stepped onto the ice and pushed off. Being out on the ice with her family, her boyfriend and her sister's boyfriend felt weird at first. Her strength hadn't fully returned and she had become unfamiliar with the sensations of skating. Kallie skated the first couple of laps with Lisa before peeling off. Over at the sideboards, she started taking pictures and video of her rosy-cheeked daughter. Kallie's little girl wasn’t pale and fragile in a wheelchair anymore. “It felt so good to look at her that way,” Kallie says. A little over seven months later, in February 2016, Lisa got exciting news. A North Dakota team doctor told her that enough of the humerus bone in her right arm had grown back for him to allow her to begin doing some drills with her teammates. The next day in the locker room, Lisa saw a red non-contact jersey hanging in her stall. Her name was on the list of active practice participants. Again, Lisa felt a little nervous about getting on the ice. The rink felt packed. It had so long since she'd skated with so many people at the same time. But her anxiety soon faded and after three drills, she shuffled off the ice, a little discouraged. The team's trainer reminded her that this was just the beginning. Less than a week after Lisa had done those first drills, she wore green and grey North Dakota sweats as she lay on her bed during a quick visit home. Her gripe was that her coaches had told her to take the day off from skating and working out. Neither her arm nor her knee were fully healed yet. Therapy still wasn't finished. On the bright side, the now-21-year-old was looking forward to a summer that would not include wearing a knee brace. She was starting to make plans. Going to her family's cabin on nearby Oak Island would be a must. Water skiing would be, too. Lisa intends to spend a lot of her time off from school working out with other college and high school hockey players and using the weight room at Warroad High. Her goals are to be on the ice with the rest of her North Dakota teammates on Day One next season and play in a game. Because she didn't play this season, she may be given an extra year of eligibility by petitioning the NCAA for a medical red shirt. Nothing is guaranteed, she knows this. However, the uncertainty is not stopping her. “I just want to give it my best shot, so if I look back, I don't have any regrets," she says. "If I never do play again, I want to be able to say I did everything I could."